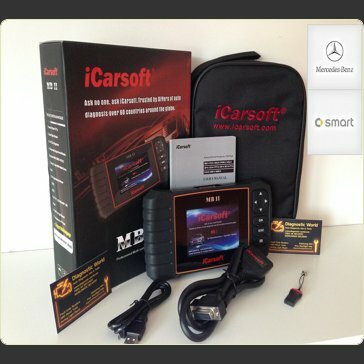 MB II is a professional and powerful vehicle fault diagnosis tool developed by iCarsoft Technology Inc. With a 4” TFT LCD and unique diagnostic software, it features full ECU diagnosis of single vehicle brand and test modes mainly include: CANBUS, ISO9141, KWP2000, J1850 etc. It will enable technicians to accurately diagnose complex problems. ● MB II can do it all-reads and clears trouble codes on all the systems such as engine, transmission, ABS and airbag etc. It will also work on other main systems such as parktronic parking sensors, air suspension, interior lighting, steering column, Xenons, overhead panel. instrument cluster, ESM, CGW central gateway, AC air conditioning & MORE.